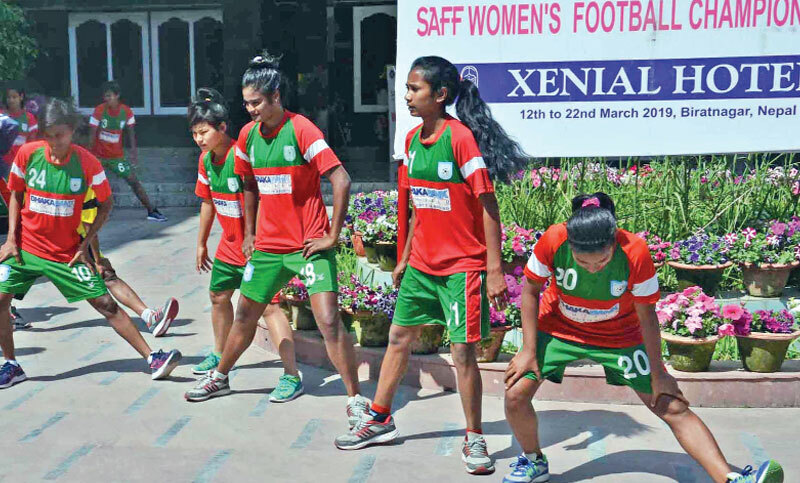 Last-time runners-up Bangladesh National Women’s Football Team will face all four times champions India in the second semi-final of the six-nation SAFF Women’s Championship on Wednesday (March 20) at the Shahid Rangashala in Biratnagar, Nepal. The second semi-final between the two neighbours will kick off at 3:00pm (BST). Hosts Nepal will meet Sri Lanka in the first semi-final at 11:15am on the same day and same venue. Earlier, they were handed a 0-3 goal defeat by Nepal in their last Group-A encounter of SAFF Women’s Championship at the Shahid Rangsala Stadium in Nepal on Saturday. With this defeat, Bangladesh advanced to the semi-final of the tournament as the group-runners-up. Golam Rabbani Chhoton’s girls, who entered the match having already confirmed semifinal berth following a 2-0 win against Bhutan in their opening match, conceded all the three goals in the first half. Ahead of the tough semi-final against India, Bangladesh team had a review and evaluation meeting on Saturday night with the players. At the meeting, the team officials tried to motivate players and briefed them to boost their optimism and confidence level, maintaining their fitness level. On Sunday, they made light exercise, including swimming.